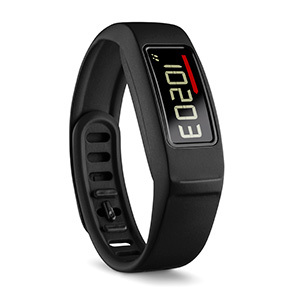 It's purely a fitness tracker, it won't show messages or do any syncing with a phone other than to (slowly) transfer my activity data. But, unlike a lot of other wearables, it uses a non-rechargable lithium cell (CR1632 - not a very common size, couldn't find any in Poundland so ordered some spares online) which can last up to 12 months. I've not had to change mine in the 9 months I've had it. It's waterproof and I've never needed to take it off. 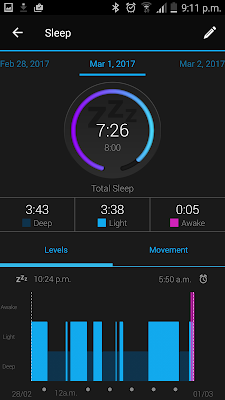 As well as steps, it can measure heart rate (with a chest strap which I've never tried) and sleep (by tracking movement, not by brain waves or anything as clever). 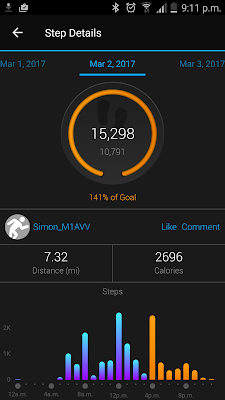 I usually keep an eye on steps and distance throughout the day, walking a bit more in my lunch break since I've got it. 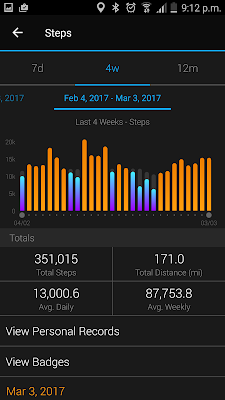 At the gym it's sort of useful, some of my gym activity adds to the step and distance count but it's no use on the bike and might not be that accurate on treadmill and cross trainer as the movement isn't natural walking or running. The daily step target varies depending on how well I've done over the last few days, it's usually over 10000 unless I've spent a few days off work doing nothing. 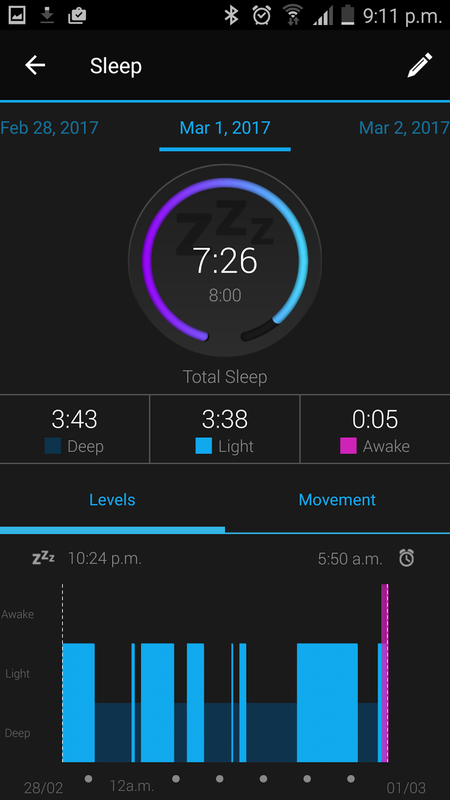 Here are a few screenshots from the Android app, Garmin Connect. I find that to sync the device, I need to start the app, kill it in the task manager and then start it again before pressing the sync button. The app also needs internet access to work at all, it won't even sync offline as all the data is stored on Garmin's servers. 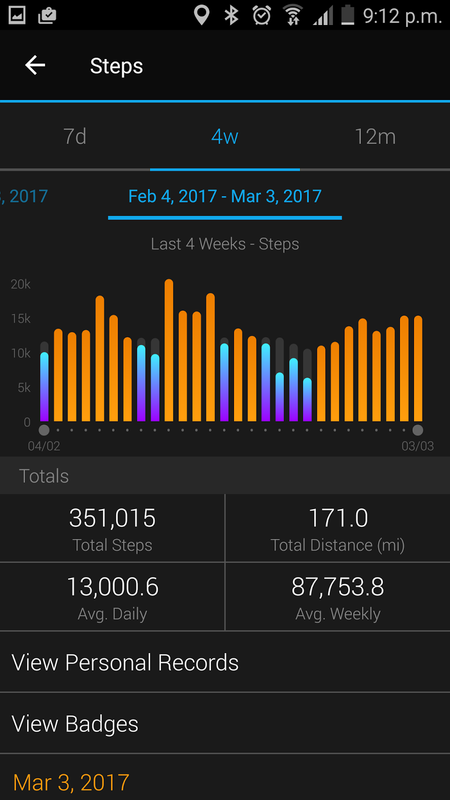 My best 28 days was around 400000 steps, in the summer. 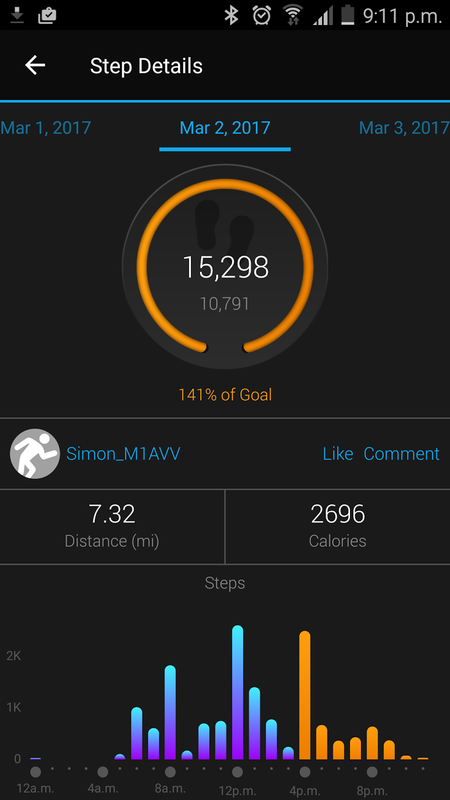 My phone also has an activity tracker, Samsung S Health, which is always running but I don't take much notice of it as I don't always have my phone with me when exercising. It usually says I've done enough steps each day anyway but I think the target is set to something really low like 6000.